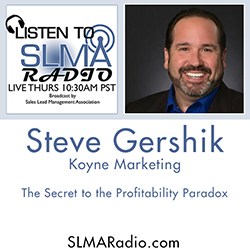 Steve Gershik is the founder and president of bay area Koyne Marketing (newly launching on September 1, 2016). Steve brings 20 years of global B2B marketing experience to Koyne Marketing, including his roles as CEO of 28Marketing, a demand generation consulting company, and co-founding DemandCon, the demand generation conference. Previously, Steve was VP of Marketing at TOA Technologies and Eloqua, among other technology leadership roles. He is on the Executive Council of the Marketing Automation Institute and has been named one of the Top 50 Leaders in Sales Lead Management by the SLMA and is also in demand as a frequent speaker at industry conferences and webinars.